You are trying to use equivocation. This is like saying that YOU are a terrorist because I define terrorism as people that support conservative views online. Sorry but this is not valid. It's more of a graph, not a circle. 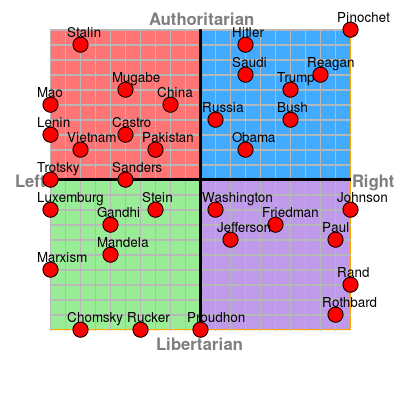 The authoritarian regime of Stalin would be much further left and fall outside of the circle. Man, I said I'd leave and I don't know why I'm wasting my Saturday night on this but "Deny Ignorance" I guess. You haven't understood the core of what I have said several times but will try one last time. Right Wing is not defined purely in economic terms. Right wing can still include economic authoritarianism and control. Right wing does not equal "liberalism". The key is in social structure, particularly class. 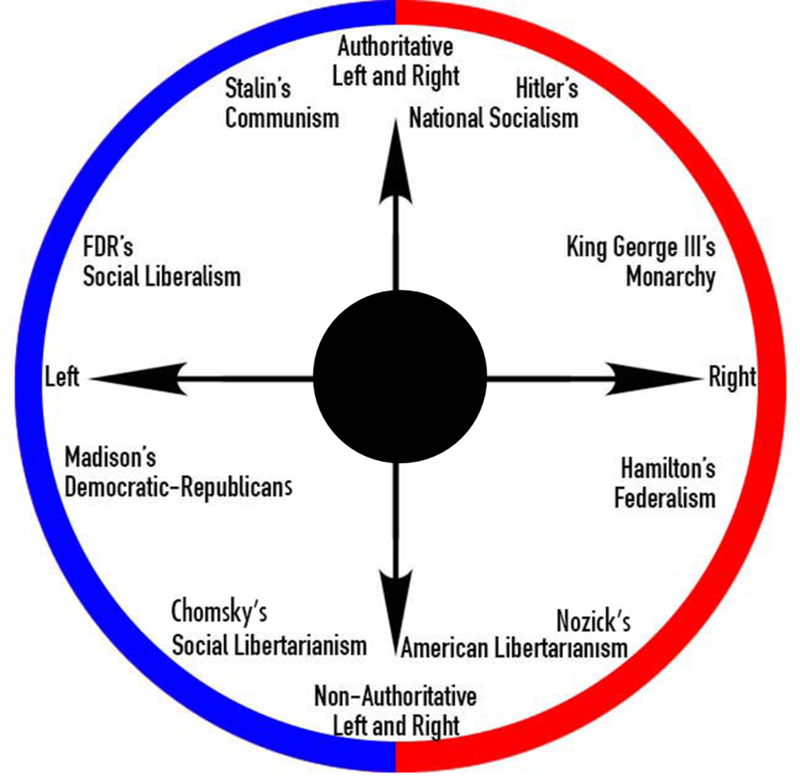 Right wing means "naturally" leaving social class and position to either merit or means (wealth or social prestige). It means that the underlying social structure is one of "have's" and "have not's". Left wing according to Marxist theory means the abolishment of social class and position to one of "egalitarianism" where every person holds an equal position in society. Everyone, regardless of who their parents are or what their ethnicity is considered of equal merit. Nazi Germany was not constructed this way. In fact they outright rejected this philosophy. They very much believed that some were better than others and in the case of Nazi Germany that was based on Race, primarily. Not to mention the fact, as I have stated in the past, that to Marx people who owned ANY of the means of production, no matter how small, to Marx was part of the bourgeoisie... A family who own a small to medium farm are part of the bourgeoisie because they own part of the means of production. This is why farms are completely taken over by the state under socialism and communism, which the nazis did as well. These underlying social structures are the reason historians class Nazi Germany as right wing. The economics you are hung up on are irrelevant in this regard. This is all from me because you have blinkers on and are not listening or are unable to comprehend. Edit: I have tried to simplify that as much as I can. It is much more complicated than that. What many of you among the left can't understand is that Marx contradicted himself about "The Classes." On the one hand he claimed that in communism a classless society will ensued, on the other hand he also stated that the rules of the classes would reverse with the "proletariat" becoming the rulers. ...the first step in the revolution by the working class, is to raise the proletariat to the position of ruling class, to win the battle for democracy. You will try to claim "but that's only the first step," but as a matter of fact Marx himself stated the dictatorship of the proletariat was to become permanent. It is why he called it the permanent revolution. If the "proletariat" are to become the ruling class, despite Marx claims at times that it was only temporary, for it to remain a permanent revolution somebody has to be in charge. In the case of socialism/communism the most loyal supporters of these ideas (socialism/communism) become the ruling class. Guys, the long and short of all this is that all evil comes from the left. There are zero evil right leaning people. It’s that simple, the left are Satan worshipping heathens who want to steal your soul. The right are pure, wholesome and righteous. In simple terms you are correct. The 'right', which is also a meaningless label, is for Freedom and individuality with govt restricted to running essential services only and staying out of people's lives. ROFLMAO, Could you point out where i wrote that?... Ironic how the ONLY way you can argue this is by trying to mock the messenger... How about you PROVE any of those policies implemented by the nazis were "right-wing..."
Ironic that you make this claim when it is YOU/the left who keep on making false accusations about "the right are the nazis" when every policy implemented by them is "socialist..."
Odd..I’ve never called the right nazis. Jesus would not be pleased! You post some right rubbish. So how about that favourite right wing mate of Margaret Thatcher one Augusto Pinochet, former Military Dictator of Chile. His lists of crimes against his own people and others is to long to write, but here are some snippets.